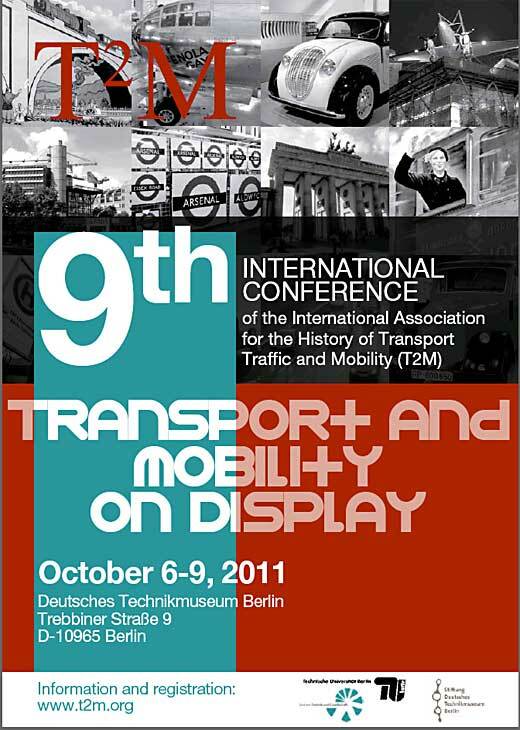 The conference title this year is “Transport and Mobility on Display”. Many papers, sessions, round table discusssions and excursions refer to the impact and effect of transport and mobility museums, exhibitions and built infrastructures. The conference, however, covers the whole range of historical transport studies. It is the annually most important event in the history of transport and mobility worldwide. This website contains all informations concerning the conference and the T2M-summerschool. Here, you can register for the conference, book your hotel, apply for a prize or for a travelgrant, get informations on the venue and the city of Berlin. We are very much looking forward to see you in Berlin. On behalf of the local organizing committee, the hosting museum and T2M. The 2011 winner of the £250 (pounds Sterling) prize is Alexander Medcalf, a PhD student at the Institute of Railway Studies and Transport History at the University of York. His submission forms part of his research into the commercial cultures of one of Britain’s best known railway companies in the first half of the twentieth century. The thesis title is “Picturing the Railway Passenger as Customer in Britain: the Great Western Railway, 1903-1939”.